Caption - South African Railways (SAR) 19B class 4-8-2's 1405 and 1404 leave the loco shed at Graaff Reinert in September 1972. They are ready to take the weekly Mosselbaai to Johannesburg train over Lootsberg Pass as far as Rosmead. There were 14 class 19Bs which were built by Berliner Maschinenbau in 1930. 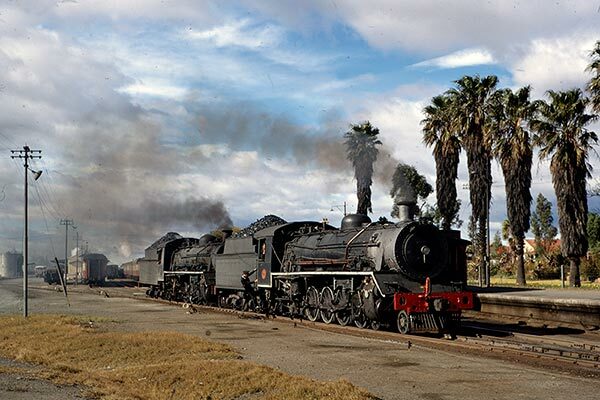 In their last years of service, the surviving members of the class were based at Graaff-Reinet from they worked across the Lootsberg Pass to Rosmead.